Republican County Councilman John Grasso is teaming with a radical left-wing group associated with the Anne Arundel Democratic Party to hold a candidates forum. In an email shared with Red Maryland, an individual named John Wells is said to be an organizing the forum. The email was sent to all filed Republican candidates. We are ready to roll on the first event for the “Let’s Agree to Agree”initiative. John Grasso and Stuart Pittman will be the featured leaders at the event, and it is very important to have as many Republican candidates there as possible. All Democratic candidates will be invited also. The working meeting will be preceded by a one hour “Meet and Greet” Social, which should be a great way to break the ice and meet the people you will be working with. Come ready to roll up your sleeves and get to work. The meeting will have a specific target action to modify the County Charter, and we will have plenty of experts to help, but we also need incumbents and candidates to be there. I have attached a document outlining some of the tools that are available at the website and how you can help to make them useful in your campaigns. Also attached is a downloaded Republican page from the website. to have as many people signed up as possible before I send out those invitations. There will also be articles in The Capital and the Anne Arundel Patriot about the event. I think that this website can be a tremendous tool for you as candidate and I am asking for your support in making the website as useful as possible. I hope you will take the time to read the attachments, and that you will do as much as you can to promote the event. While the email noted that the form was to be held January 29th, it has been postponed. A new date has not been announced by the organizers. If all of this looks suspicious, it’s because it is. John Wells, the event organizer, is the listed point of contact for the radical leftist group Annapolis Indivisible. Curiously, a document attached with the invitation to Republican candidates also contained a document Wells was using to coordinate with Democratic candidates, showing that Wells and his Annapolis Indivisible group were in direct coordination with candidates in the Anne Arundel Democratic Party. The document is shown here below. The document also included a live spreadsheet of contact information for Democratic candidates and events. The link to it is here, but I have also replicated it on Red Maryland as well. So now that we know that the group organizing the event is a group of radical left-wing organizations closely tied to the Anne Arundel Democratic Party. Which begs the question; why is John Grasso getting in bed with them? We’ve talked extensively about John Grasso, his ego, his refusal to answer our questions, his misuse of the county seal. But you really haven’t heard much at all about Grasso’s campaign for county executive since he announced it. According to last week’s campaign finance filings, he hasn’t raised almost any money since his county executive announcement. He trails Steve Schuh significantly in cash on hand; Schuh has $1,062,020.58, Grasso has $9,323.77. John Grasso’s campaign for county executive is already over; he just seems not to realize it yet. But none of that excuses what Grasso is doing here. Why is Grasso willingly not just participating in a forum put on by radical left-wing statists, but serving in a leadership capacity in the event? Is Grasso expecting that he can use this opportunity to work with the radical left to attack Schuh? Does he think that his only path to winning the nomination is to use Democrats to do his dirty work for him? Grasso may have been a Republican for the last thirty years, and may have been elected twice as a county councilman. 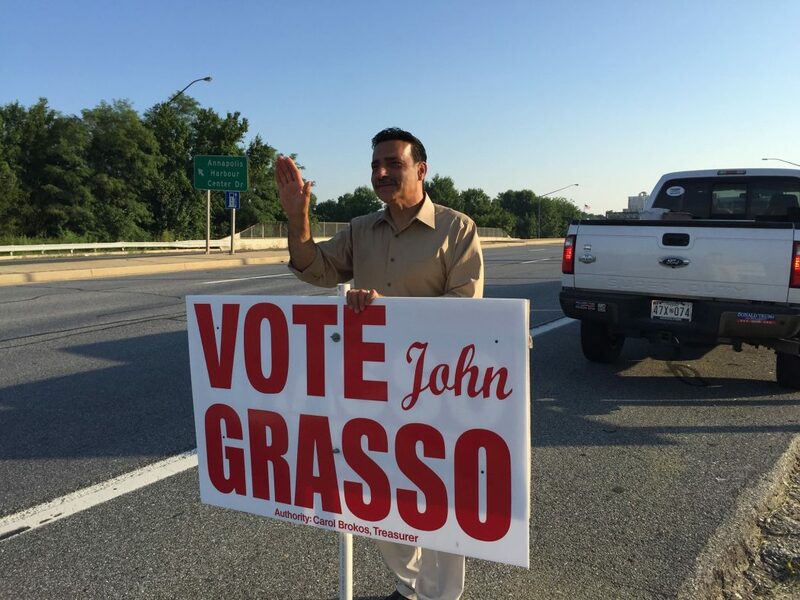 But this is a sad, sad way for John Grasso’s political career to come to an end.